Adjustable leg pad accomodates all users. Protective molded guards in high wear/scuff areas. Back support pivots into 6 different positions from 0 to 25 degrees. Elevated knee position reduces low-back stress. Back adjusts into 5 positions: flat, 30, 45, 60 and 80 degrees. Seat adjusts into 2 positions. Handle and wheels provide easy movement. Backrest adjusts into 17-degree decline, flat and 6 incline positions: 15, 30, 45, 60, 67 and 80 degrees. Seat adjusts into 3 positions. Adjustable rollers hold user in position while in decline. Split-pad design and double-adjustable leg pads hold any size user in proper position. Handle is mounted on front rollers, providing easy exit. Telescoping lower leg pad adjustment to accommodate users of all sizes, multiple positioning for exercise variation 0 to 30 degrees of decline, weight plate pegs for storage of small plates for added resistance. 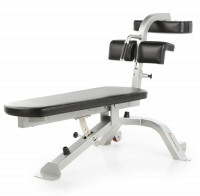 Adjustment-Backrest adjusts vertically to fit a wide variety of members and tilts for various abdominal exercises. Gas Shock-Gas Shock facilitates backrest adjustments. Leg Pads-Contoured leg pads provide a comfortable fit for many users. 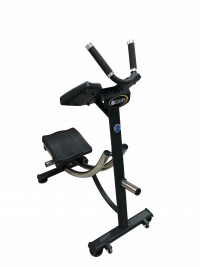 The flagship product of the Ab Coaster Commercial Series product line features stainless steel rails for an ultra-smooth ride, adjustable hand grips, and a free-style motion seat. The CTL is a new addition to the Ab Coaster Commercial Series product line. The unique design of the CTL features the patented Ab Coaster bottom-up movement without rails.